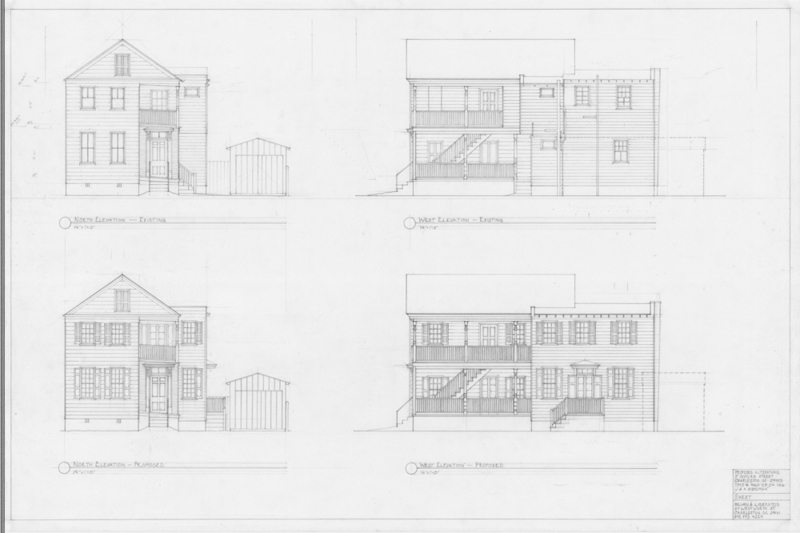 This design for a new single-family dwelling located in the heart of Charleston's Historic District is currently under construction. It received 11 letters of support from neighbors, including the unanimous support "with praises" from the neighborhood association, and the full, unconditional support of the City Architect at the Board of Architectural Review, where it passed unanimously. These two houses are part of an urban infill project in the Cannonborough-Elliottborough neighborhood of Charleston's Historic District. The project will create a small-scale urban inner-block network, similar to Charleston's "courts." One house sits above the driveway into Catfiddle Street. This 1740s Category I listed house is located in the oldest part of Charleston’s Historic District and had accumulated a series of unresolved and unsuitable additions housing modern conveniences on the façade facing its Loutrel Briggs garden. New owners wanted to restore the house’s Georgian dignity by replacing these previous additions with a new, stylistically-appropriate one whilst retaining the modern conveniences. 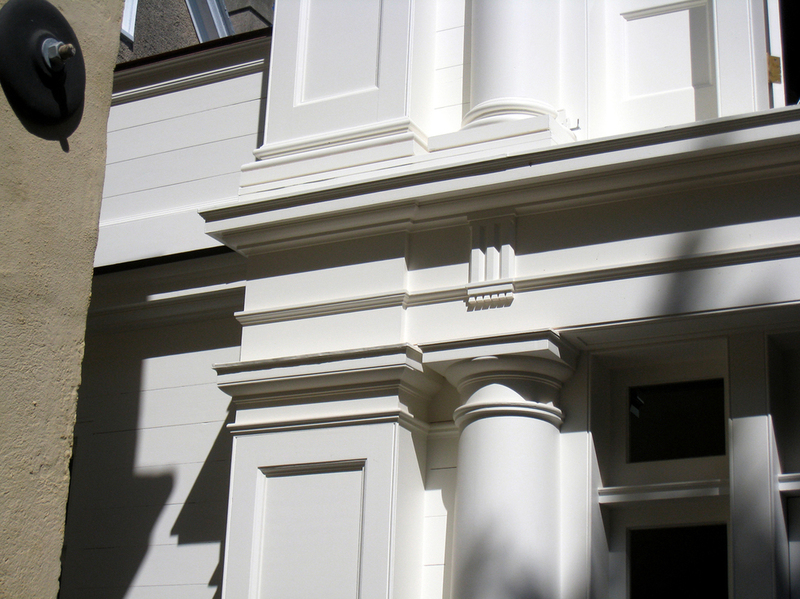 This new enclosed neo-classical colonnade has custom columns, corner piers, and entablature moldings which were carefully designed and proportioned to suit the existing 18th-century house. Awarded the Pro-Merito Carolopolis Award by the Preservation Society of Charleston. Still under construction, this project is the renovation of a mid-19th-century Charleston single-house. 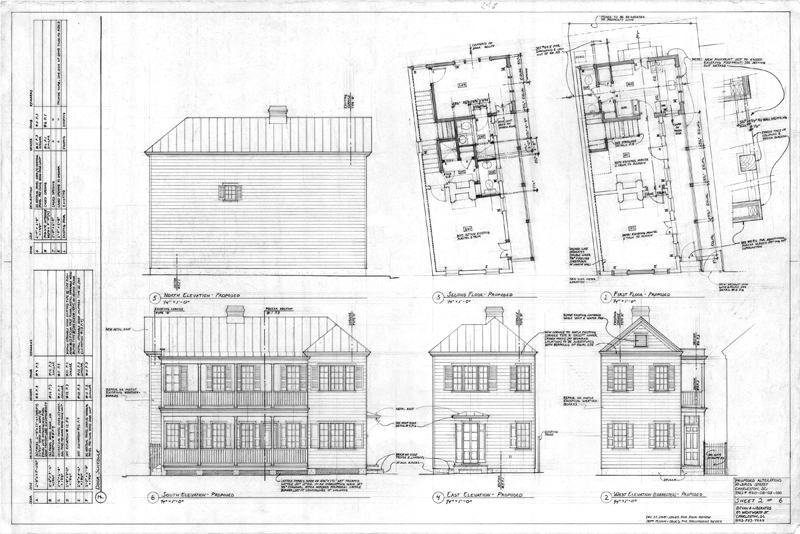 This project, still under construction, entailed plans and Board of Architecture approval for revitalizing a 19th-century Charleston single-house variant located in the Historic District. Two proposals for a new architecture school for the corner of Meeting and George Streets in Charleston's Historic Districts. 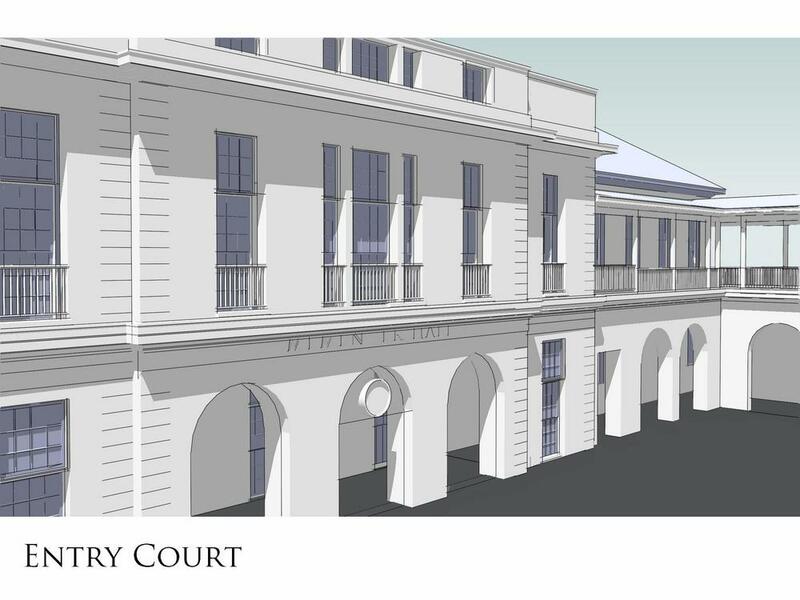 The first scheme provides a Hall of Architectural Review on the corner and porches facing a garden; the second scheme has two colonnaded entrances into a centralized courtyard. Both would be built of masonry and stucco. This c.1810 Federal style Charleston single-house had fallen into bad hands, having been subdivided into multiple apartments, its original entrance lost and its windows altered. New owners sought to restore the house and convert it back to single-family use. Working with the original door and timber framing, we designed a new front door surround consisting of a pair of simple, unfluted Doric pilasters using the thin moldings and elongated proportions found in the rest of the house and typical to the Federal style. The design for this elementary school is informed by both traditional architectural and traditional urban design principles. Designed with Charleston’s sub-tropical climate in mind, the plan is broken up into component parts such that rooms have as many windows facing different directions as possible in order to catch the breeze, an architectural solution found throughout Charleston. Whereas the current building has inoperable windows, making the building uninhabitable without constant air-conditioning, this proposal has our post-cheap-oil future in mind and makes use of operable shutters, shade from balconies, open courtyards, and covered walkways. The new school creates and faces a new public square to the east, Memminger Square. The design for this new mixed-use building at the prominent corner of King and Calhoun Streets on Marion Square is dignified and purposefully simple, allowing the more monumental buildings on the square to play their rightful roles. 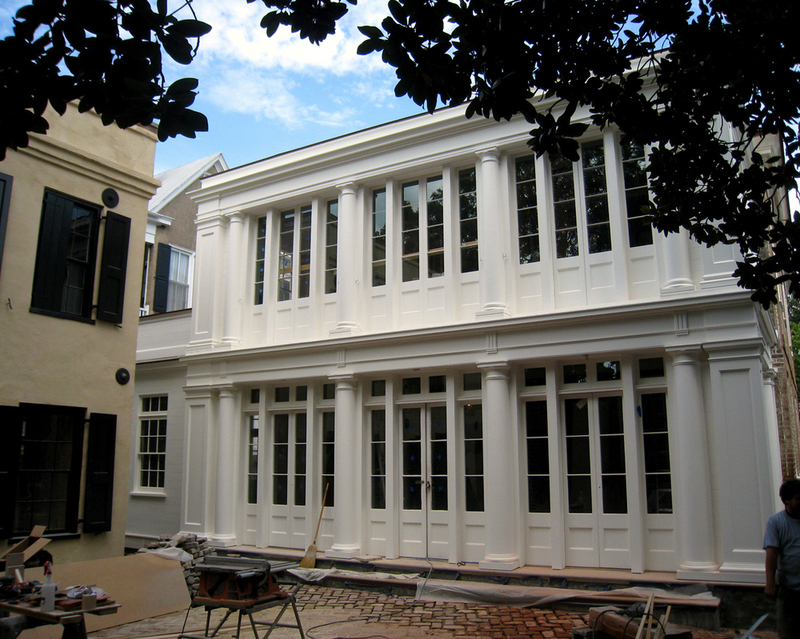 We used the restrained classical style found throughout Charleston and which can be both expressive and economical. It’s character is that of a quiet but well-detailed contributing background building. Still, the new open arcaded portico along King Street will be a spectacular addition to the city, which has lost many of the sidewalk-covering porticos which once augmented Charleston’s European ambiance. Owners of a Lowcountry farm wanted to build a barn based as faithfully as possible on Charles Fraser’s c.1799 watercolor of an unknown plantation barn. Although it is a modern working barn, it is designed using proportions still in use during the colonial era.